Extraterrestrial liquid water (from the Latin words: extra ["outside of, beyond"] and terrestris ["of or belonging to Earth"]) is water in its liquid state that naturally occurs outside Earth. It is a subject of wide interest because it is recognised as one of the key prerequisites for life as we know it and thus surmised as essential for extraterrestrial life. Water on Mars exists today almost exclusively as ice, with a small amount present in the atmosphere as vapour. Some liquid water may occur transiently on the Martian surface today but only under certain conditions. No large standing bodies of liquid water exist because the atmospheric pressure at the surface averages just 600 pascals (0.087 psi)—about 0.6% of Earth's mean sea level pressure—and because the global average temperature is far too low (210 K (−63 °C)), leading to either rapid evaporation or freezing. Features called recurring slope lineae are thought to be caused by flows of brine — hydrated salts. In July 2018, it was announced that the European Space Agency's Mars Express probe had discovered evidence of liquid water near the south polar ice cap of Mars. The Mars Express team interpreted radar data as indicative of liquid water in an area of about 20 square kilometers, approximately 1.5 kilometers beneath the surface. They also expressed confidence that other liquid water deposits would be discovered on Mars using this method. The "ice giant" (sometimes known as "water giant") planets Uranus and Neptune are thought to have a supercritical water ocean beneath their clouds, which accounts for about two-thirds of their total mass, most likely surrounding small rocky cores. This kind of planet is thought to be common in extrasolar planetary systems. Liquid water has a distinct absorption spectroscopy signature compared to other states of water due to the state of its hydrogen bonds. Despite the confirmation of extraterrestrial water vapor and ice, however, the spectral signature of liquid water is yet to be confirmed outside of Earth. The signatures of surface water on terrestrial planets may be undetectable through thick atmospheres across the vast distances of space using current technology. For the Jovian moons Ganymede and Europa, the existence of a sub-ice ocean is inferred from the measurements of the magnetic field of Jupiter. Since conductors moving through a magnetic field produce a counter-electromotive field, the presence of the water below the surface was deduced from the change in magnetic field as the moon passed from the northern to southern magnetic hemisphere of Jupiter. "Chaos terrain", a common feature on Europa's surface, is interpreted by some[who?] as regions where the subsurface ocean has melted through the icy crust. Geysers have been found on Enceladus, a moon of Saturn, and Europa, moon of Jupiter. These contain water vapour and could be indicators of liquid water deeper down. It could also be just ice. In June 2009, evidence[clarification needed] was put forward for salty subterranean oceans on Enceladus. On April 3, 2014, NASA reported that evidence[clarification needed] for a large underground ocean of liquid water on Enceladus, moon of planet Saturn, had been found by the Cassini spacecraft. According to the scientists, evidence of an underground ocean suggests that[how?] Enceladus is one of the most likely places in the solar system to "host microbial life". Emissions of water vapor have been detected from several regions of the dwarf planet Ceres. combined with evidence of ongoing cryovalcanic activity. Scientists used gravitational measurements from the Cassini spacecraft to confirm a water ocean under the crust of Enceladus. Such tidal models have been used as theories for water layers in other Solar System moons. According to at least one gravitational study on Cassini data, Dione has an ocean 100 kilometers below the surface. Scientists have detected liquid water using radio signals. The Radar Detection And Ranging (RADAR) instrument of the Cassini probe was used to detect the existence of a layer of liquid water and ammonia beneath the surface of Saturn's moon Titan that are consistent with calculations of the moon's density. Ground penetrating radar and dielectric permittivity data from the MARSIS instrument on Mars Express indicates a 20-kilometer-wide stable body of briny liquid water in the Planum Australe region of planet Mars. Artists conception of the subsurface water ocean confirmed on Enceladus. Models of Saturn's moon Titan density indicate the presence of a subsurface ocean layer. Similar density estimations are strong indicators of an subsurface ocean on Enceladus. Some models of the dwarf planet Ceres, largest object in the asteroid belt indicate the possibility of a wet interior layer. Water vapor detected to be emitted by the dwarf planet may be an indicator, through sublimation of surface ice. The Gliese 581 planetary system contains multiple planets that may be candidates for surface water, including Gliese 581c, Gliese 581d, might be warm enough for oceans if a greenhouse effect was operating, and Gliese 581e. File:Artist impression of the protoplanetary disc surrounding the young star MWC 480.webm Long before the discovery of water on asteroids on comets and dwarf planets beyond Neptune, the Solar System's circumstellar disks, beyond the snow line, including the asteroid belt and the Kuiper Belt were thought to contain large amounts of water and these were believed to be the Origin of water on Earth. Given that many types of stars are thought to blow volatiles from the system through the photoevaporation effect, water content in circumstellar disks and rocky material in other planetary systems are very good indicators of a planetary system's potential for liquid water and a potential for organic chemistry, especially if detected within the planet forming regions or the habitable zone. Techniques such as interferometry can be used for this. In 2007, such a disk was found in the habitable zone of MWC 480. In 2008, such a disk was found around the star AA Tauri. In 2009, a similar disk was discovered around the young star HD 142527. In 2013, a water-rich debris disk around GD 61 accompanied by a confirmed rocky object consisting of magnesium, silicon, iron, and oxygen. The same year, another water rich disk was spotted around HD 100546 has ices close to the star. There is, of course, no guarantee that the other conditions will be found that allow liquid water to be present on a planetary surface. Should planetary mass objects be present, a single, gas giant planet, with or without planetary mass moons, orbiting close to the circumstellar habitable zone, could prevent the necessary conditions from occurring in the system. However, it would mean that planetary mass objects, such as the icy bodies of the solar system, could have abundant quantities of liquid within them. The asteroid 24 Themis was the first found to have water, including liquid pressurised by non-atmospheric means, dissolved into mineral through ionising radiation. Water has also been found to flow on the large asteroid 4 Vesta heated through periodic impacts. I think that the material of the lunar globe is not land and water, and this alone is enough to prevent generations and alterations similar to ours. ↑ 1.0 1.1 1.2 Dyches, Preston; Chou, Felcia (7 April 2015). "The Solar System and Beyond is Awash in Water". NASA. Retrieved 8 April 2015. ↑ 3.0 3.1 "Mars Probably Once Had A Huge Ocean". Sciencedaily.com. 2007-06-13. Retrieved 2012-01-22. ↑ ""NASA Mars Spacecraft Reveals a More Dynamic Red Planet"". ↑ 11.0 11.1 Orosei, R.; Lauro, S. E.; Pettinelli, E.; Cicchetti, A.; Coradini, M.; Cosciotti, B.; Di Paolo, F.; Flamini, E.; Mattei, E.; Pajola, M.; Soldovieri, F.; Cartacci, M.; Cassenti, F.; Frigeri, A.; Giuppi, S.; Martufi, R.; Masdea, A.; Mitri, G.; Nenna, C.; Noschese, R.; Restano, M.; Seu, R. (2018). "Radar evidence of subglacial liquid water on Mars". Science: eaar7268. Bibcode:2018Sci...361..490O. doi:10.1126/science.aar7268. ISSN 0036-8075. ↑ "Tidal Heating". Archived from the original on 29 March 2006. ↑ ""NASA's Hubble Observations Suggest Underground Ocean on Jupiter's Largest Moon"". ↑ Ruesch, O.; Platz, T.; Schenk, P.; McFadden, L. A.; Castillo-Rogez, J. C.; Quick, L. C.; Byrne, S.; Preusker, F.; OBrien, D. P.; Schmedemann, N.; Williams, D. A.; Li, J.- Y.; Bland, M. T.; Hiesinger, H.; Kneissl, T.; Neesemann, A.; Schaefer, M.; Pasckert, J. H.; Schmidt, B. E.; Buczkowski, D. L.; Sykes, M. V.; Nathues, A.; Roatsch, T.; Hoffmann, M.; Raymond, C. A.; Russell, C. T. (2016-09-02). "Cryovolcanism on Ceres". Science. 353 (6303): aaf4286–aaf4286. Bibcode:2016Sci...353.4286R. doi:10.1126/science.aaf4286. ↑ NASA Completes Study of Future ‘Ice Giant’ Mission Concepts. NASA TV. 20 June 2017. ↑ NASA, On to the Ice Giants. (PDF) Pre-Decadal study summary, presented at the European Geophysical Union, 24 April 2017. ↑ 25.0 25.1 "Distant 'water-world' confirmed". BBC News. Retrieved 3 October 2015. ↑ 26.0 26.1 "Hubble Reveals a New Class of Extrasolar Planet". Retrieved 3 October 2015. ↑ Gold, T., Proceedings of the National Academy of Sciences, 1989. ↑ "Science@NASA, The Case of the Missing Mars Water". Archived from the original on 27 March 2009. Retrieved 7 March 2009. ↑ "A numerical model for an alternative origin of Lake Vostok and its exobiological implications for Mars". Journal of Geophysical Research. 106: 1453. Bibcode:2001JGR...106.1453D. doi:10.1029/2000JE001254. Retrieved 2009-04-08. ↑ 38.0 38.1 38.2 Platt, Jane; Bell, Brian (3 April 2014). "NASA Space Assets Detect Ocean inside Saturn Moon". NASA. Retrieved 3 April 2014. ↑ 39.0 39.1 39.2 Iess, L.; Stevenson, D.J. ; Parisi, M.; Hemingway, D.; Jacobson, R.A.; Lunine, J.I. ; Nimmo, F.; Armstrong, J.w. ; Asmar, S.w. ; Ducci, M.; Tortora, P. (4 April 2014). "The Gravity Field and Interior Structure of Enceladus". Science. 344 (6179): 78–80. Bibcode:2014Sci...344...78I. doi:10.1126/science.1250551. PMID 24700854. Retrieved 3 April 2014. ↑ Sori, Michael M.; Byrne, Shane; Bland, Michael T.; Bramson, Ali M.; Ermakov, Anton I.; Hamilton, Christopher W.; Otto, Katharina A.; Ruesch, Ottaviano; Russell, Christopher T. (2017). "The vanishing cryovolcanoes of Ceres". Geophysical Research Letters. 44 (3): 1243–1250. Bibcode:2017GeoRL..44.1243S. doi:10.1002/2016GL072319. ISSN 0094-8276. ↑ "Tidal Heating". geology.asu.edu. Archived from the original on 29 March 2006. ↑ Beuthe, Mikael; Rivoldini, Attilio; Trinh, Antony (2016). "Enceladus's and Dione's floating ice shells supported by minimum stress isostasy". Geophysical Research Letters. 43 (19): 10,088–10,096. arXiv:1610.00548  . Bibcode:2016GeoRL..4310088B. doi:10.1002/2016GL070650. ISSN 0094-8276. ↑ 51.0 51.1 51.2 51.3 Hussmann, Hauke; Sohl, Frank; Spohn, Tilman (November 2006). "Subsurface oceans and deep interiors of medium-sized outer planet satellites and large trans-neptunian objects" (PDF). Icarus. 185 (1): 258–273. Bibcode:2006Icar..185..258H. doi:10.1016/j.icarus.2006.06.005. ↑ "NASA Finds Earth-Size Planet Candidates in Habitable Zone, Six Planet System". Sciencedaily.com. 2011-02-02. arXiv:1102.0291  . Bibcode:2011Natur.470...53L. doi:10.1038/nature09760. Retrieved 2012-01-22. ↑ Eisner, J. A. (2007). "Water vapour and hydrogen in the terrestrial-planet-forming region of a protoplanetary disk". Nature. 447 (7144): 562–564. arXiv:0706.1239  . Bibcode:2007Natur.447..562E. doi:10.1038/nature05867. ISSN 0028-0836. ↑ Carr, J. S.; Najita, J. R. (2008). "Organic Molecules and Water in the Planet Formation Region of Young Circumstellar Disks". Science. 319 (5869): 1504–1506. Bibcode:2008Sci...319.1504C. doi:10.1126/science.1153807. ISSN 0036-8075. ↑ Honda, M.; Inoue, A. K.; Fukagawa, M.; Oka, A.; Nakamoto, T.; Ishii, M.; Terada, H.; Takato, N.; Kawakita, H.; Okamoto, Y. K.; Shibai, H.; Tamura, M.; Kudo, T.; Itoh, Y. (2009). "DETECTION OF WATER ICE GRAINS ON THE SURFACE OF THE CIRCUMSTELLAR DISK AROUND HD 142527". The Astrophysical Journal. 690 (2): L110–L113. Bibcode:2009ApJ...690L.110H. doi:10.1088/0004-637X/690/2/L110. ISSN 0004-637X. ↑ "Watery asteroid discovered in dying star points to habitable exoplanets". Phys.org. 10 October 2013. Retrieved 12 October 2013. ↑ Mack, Eric (17 October 2011). "Newly spotted wet asteroids point to far-flung Earth-like planets | Crave - CNET". News.cnet.com. Retrieved 12 October 2013. ↑ Honda, M.; Kudo, T.; Takatsuki, S.; Inoue, A. K.; Nakamoto, T.; Fukagawa, M.; Tamura, M.; Terada, H.; Takato, N. (2016). "WATER ICE AT THE SURFACE OF THE HD 100546 DISK". The Astrophysical Journal. 821 (1): 2. arXiv:1603.09512  . Bibcode:2016ApJ...821....2H. doi:10.3847/0004-637X/821/1/2. ISSN 1538-4357. ↑ Hashimoto, G. L.; Roos-Serote, M.; Sugita, S.; Gilmore, M. S.; Kamp, L. W.; Carlson, R. W.; Baines, K. H. (2008). "Felsic highland crust on Venus suggested by Galileo Near-Infrared Mapping Spectrometer data". Journal of Geophysical Research: Planets. 113: E00B24. Bibcode:2008JGRE..113.0B24H. doi:10.1029/2008JE003134. ↑ 77.0 77.1 "Where did Venus's water go?". European Space Agency. 18 December 2008. Retrieved 19 November 2016. ↑ "Frozen comet's watery past: Discovery challenges paradigm of comets as 'dirty snowballs' frozen in time". Sciencedaily.com. 2011-04-05. Bibcode:2011GeCoA..75.3501B. doi:10.1016/j.gca.2011.03.026. Retrieved 2012-01-22. ↑ De Sanctis, M. C.; et al. (2012). "DETECTION OF WIDESPREAD HYDRATED MATERIALS ON VESTA BY THE VIR IMAGING SPECTROMETER ON BOARD THE DAWN MISSION". The Astrophysical Journal Letters. 758: L36. Bibcode:2012ApJ...758L..36D. doi:10.1088/2041-8205/758/2/L36. 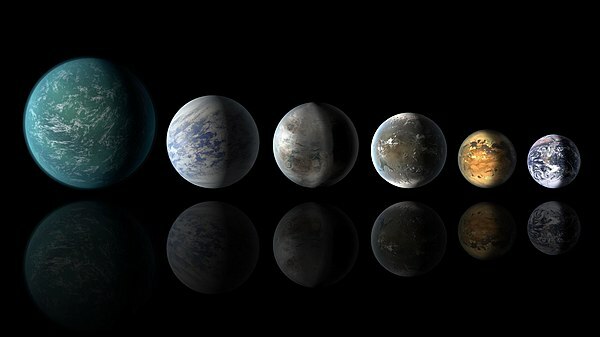 ↑ "Water-worlds are common: Exoplanets may contain vast amounts of water". Phys.org. 17 August 2018. Retrieved 17 August 2018. This article uses material from Extraterrestrial liquid water on Wikipedia (view authors). License under CC BY-SA 3.0.